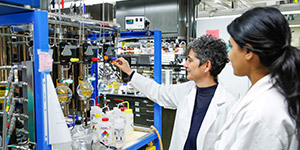 Founded in 1855 as the first college in San Francisco, the University of San Francisco has long helped to shape one of the world’s most dynamic cities. Today, USF offers more than 100 programs in the arts and sciences, business, and nursing and health professions. And today, as ever, USF inspires its students to change the world for the better. Infused with San Francisco’s spirit of optimism and innovation, a USF education is lively by nature and personal by design. With an average class size of 22, each course is an intimate learning community where top professors—not TAs—encourage students to step up, speak up, challenge their assumptions, and learn by doing. True to its Jesuit mission, USF also expects students to turn learning into positive action, with a strong commitment to social justice and to making a difference in communities near and far. So while USF graduates rank among the top 3% in the US for their earning potential, they don’t only do well in the world—they do good. 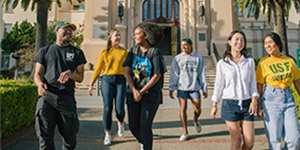 One of the most diverse universities in the United States, USF offers its students a rich and welcoming campus environment, plus all the advantages of its San Francisco location. Students from all 50 states and 98 countries exchange ideas, and in the best Jesuit tradition, USF welcomes students from all backgrounds—and all or no religions—and invites input from every perspective. This combination of academic rigor and open-minded inquiry creates a unique campus atmosphere in which students grow and thrive. Of course, they also love being in the geographic center of the city, with its natural beauty, 36 unique neighborhoods, cultural attractions, major sporting events, and nearly unlimited access to research, internship, and employment opportunities at organizations such as Google, Tesla, and Pixar. At USF, everything in San Francisco is just a walk, bike, bus, or BART ride away. • The Honors College, a hub for all honors programs at USF, connects students with interdisciplinary courses and with lectures and seminars given by world-renowned scholars, artists, and scientists. 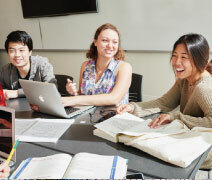 The Honors College encompasses the St. Ignatius Institute, a four-year Great Books program. Of all the resources available to USF students, our faculty are the strongest. While our professors are accomplished scholars and researchers—96% hold the highest degree in their academic disciplines—they’re at USF because they put teaching first. You’ll find them next to your desk, not behind a microphone. They’re mentors as well as teachers, and they’ll look for opportunities to put you to work helping them with research and point you toward internships. Many of our residence halls offer views of the Pacific Ocean, the city skyline, and San Francisco Bay. Loyola Village is a residential student community that features apartment-style living for students who are over 21 or have reached their junior year at USF. The Sobrato Residential Complex, to be completed in the fall of 2020, will house 600 students on campus.